It’s the last Friday of the month, which means another Fine Art Friday post. The subject matter may look similar to some of my other posts, but this month I’m on the other side of the continent! I may live in Los Angeles, but I recently traveled across the country to see our other ocean, the Atlantic. 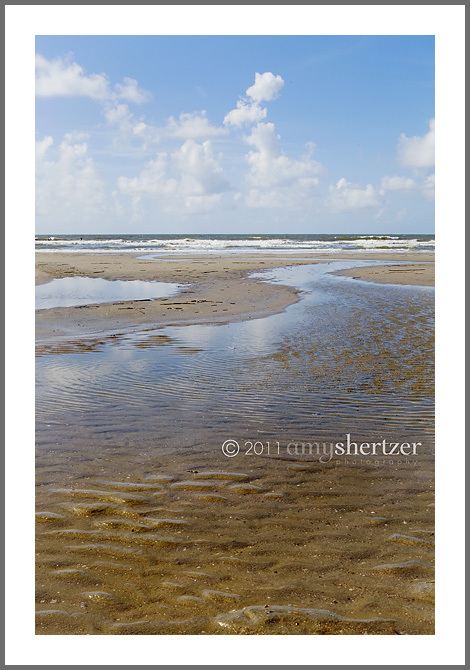 Isle of Palms, South Carolina is a beautiful beach, most notably for the tide pools that dot the wide swath of sand. They are perfect for 3-year-old splashing and 30-something-year-old lounging. And best of all for the phenomenal reflections. After soaking in this beach scene, be sure to head over to see what Pensacola Florida Photographer, Tracy Tisdale has for this month. I have a good hunch you’ll see more fabulous beach scenery, this time of the Gulf of Mexico, but she just may have something different up her sleeve this month. . . you’ll have to click over to find out! My eyes are just led right up the image to the clouds. Its beautiful! Lovely. Reminds me of another beach I frequent. Water is a lot warmer over here in the south east, huh? The pacific is always freezing to me. This image has such great leading lines. I love it. Very beautiful image. Makes me want to walk on in.